If there’s one thing I love it’s converting a regular recipe over to SCD and/or Paleo. The other morning when I was watching The Kitchen on Food Network I spotted the perfect recipe. Sunny Anderson demonstrated her Easy Braised Tomato Chicken and Spinach Fettuccine. 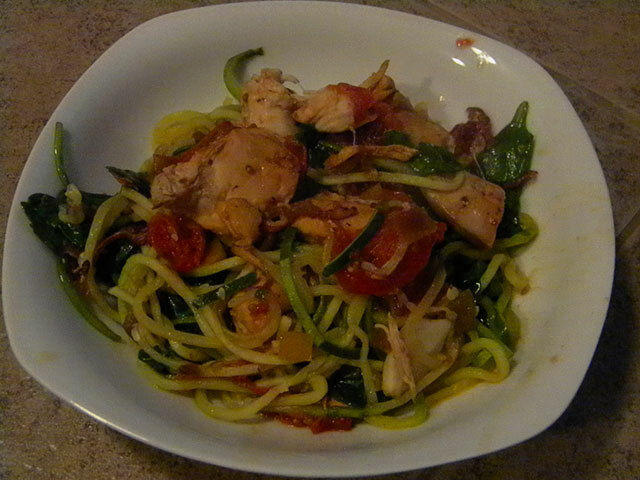 The braised chicken part is pretty much already SCD and Paleo ready, but I made a few modifications and served it with zoodles – noodles mad from spiralized zucchini. If you don’t already have a spiralizer I highly recommend getting one. It will greatly expand your gluten-free culinary horizons. As far as the modifications – I don’t like olives so I added some diced peppers and onions. I found this dish to be very refreshing. It was nice and light, completely guilt-free, and a nice change of pace from marinara. If you are so inclined a little grated Parmsan would be a nice addition. Add cubed chicken and brown on both sides for two minutes each side - this will not cook the chicken all the way through, so don't try any of it!